It seems like I’ve been living a lie. It’s not the first time that somehow I get the wrong idea about things, but this time the crash with the reality was harsh. It’s the macarons I am talking about. You see, I have made macarons before, two or three times, but I was left with the impression that it’s not big deal and I totally rock at making macarons. I was so wrong! Last week I decided to make orange flavored macarons with orange chocolate ganache, really it seemed like a great idea at the time. I had some leftover egg whites in the fridge and it only seemed logical to put them to good use. With my self-deception on max and my guard down I dove in. Since I knew how to make macarons, obviously, I decided to try the Italian meringue method, since that’s how the professional chefs are doing it. Not a good idea. 15 minutes later the macarons were in the oven and they didn’t look good. I started to doubt that there was something wrong, they didn’t hold shape and looked more like blobs than shiny shells. 10 minutes in the oven and there was no more room for suspicions. The “macarons” were hollow, hard and stuck to the paper. The biggest failure ever! I stated reading. Again. I’ve researched the matter before, but this time I was fully concentrated and determined. And I am ashamed to say that I have never seen lava in my life, and I have no idea how it flows. Have you? Why is the lava/ magma comparison so common? It didn’t help me at all. Eventually I dropped the Italian Meringue method and opted for the easier, straight-forward way. After all, you must learn to walk before you can fly. Four more batches of macarons followed. Four failed batches, that is. I developed the routine: weight the ingredients, mix, pipe, bake, stare through the oven glass, separate new egg whites for tomorrow. I even created mutant macarons with an enormous food, which collapsed in a not very appealing way. My inability to produce the perfect shell was killing me. Finally, on Saturday, it happened. The macarons rose, the size of the foot was appropriate and they hold their shape. 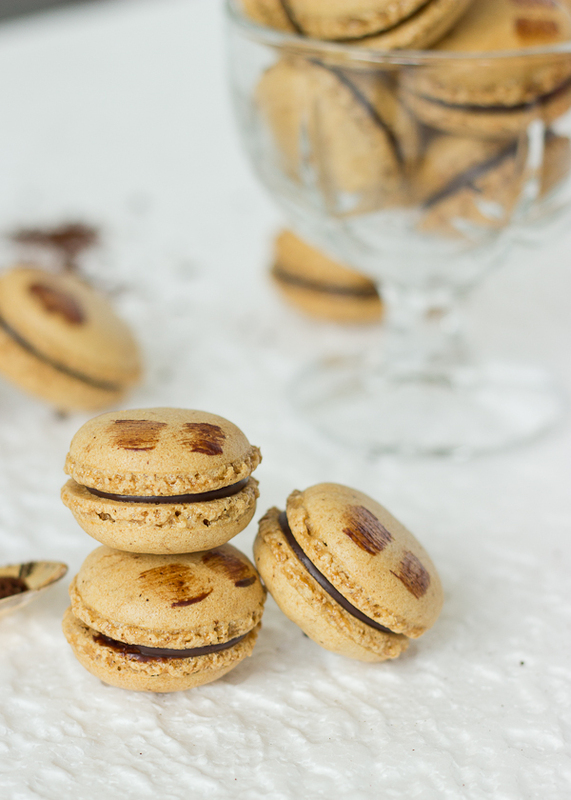 Of course, they were not immaculate, but they were real, true macarons. My eyes filled with tears. 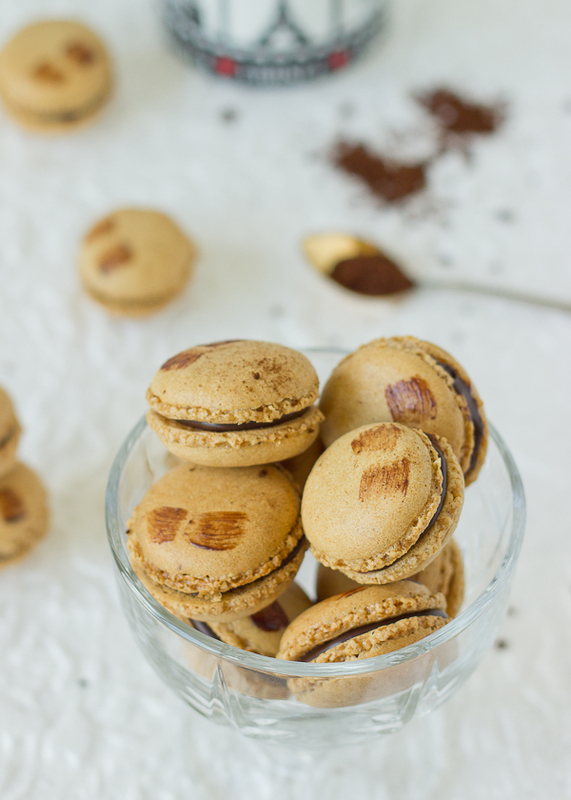 I don’t know if I can make macarons now, but I definitely know what not to do and I will share it here, so I can have it written for future references. 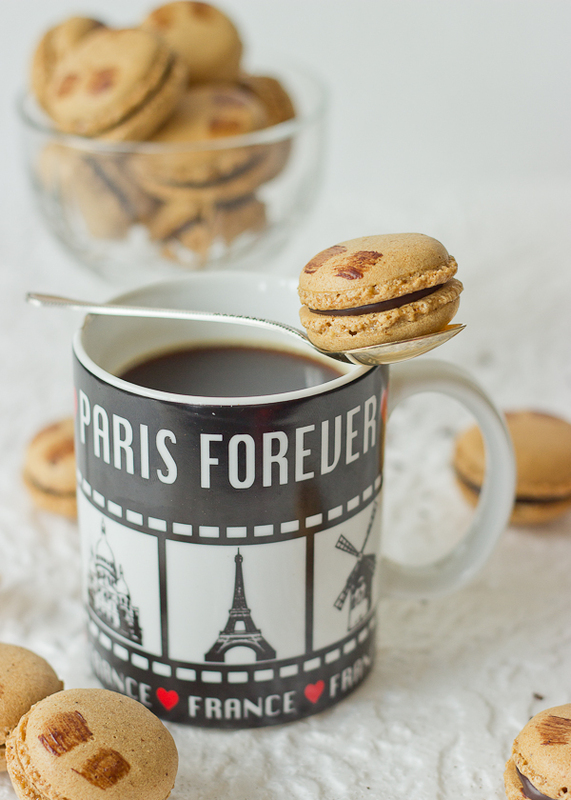 I will give my self and my family a little time off from macarons, but I see a lot of them in the future. I made my own almond flour, an since I wanted to make more than the required for one batch, I decided not to grind the almonds with the sugar, not to mess with the quantities. After a few experimentations I found what really works best for me so far. Place the blanched almonds in the food processor. How much to put really depends on the size of your bowl, but I recommend not processing more than 200 gr. at a time. Pulse, don’t hold the button, for no more than 30 seconds. The almonds should resemble coarse crumbs at this point. Transfer the crumbs to a baking tray lined with parchment paper and spread them in a thin layer. Place in the oven for 20 minutes at 100°C/200°F to dry. This step really helps. Let cool completely and store in an air-tight container in the refrigerator. It will stay good for at least one month, or even more. 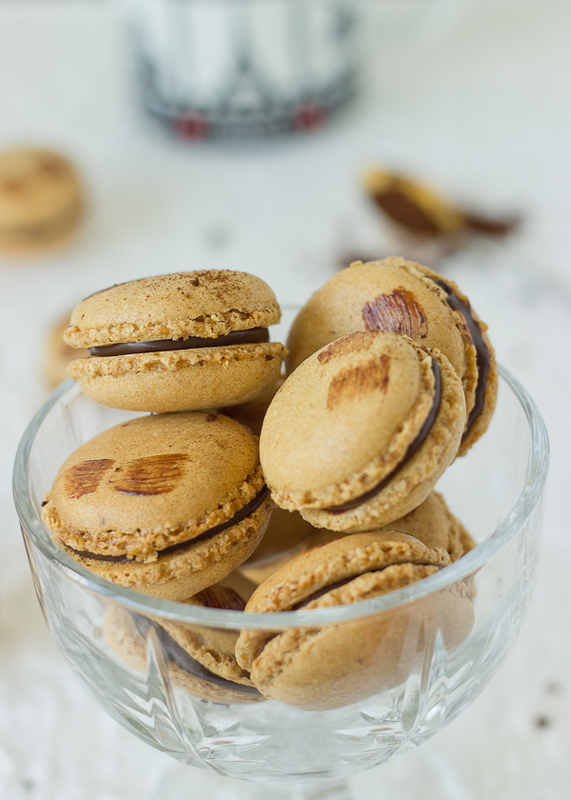 Before starting to make the macarons, weight the needed amount of almond flour, mix with the powder sugar and process again, pulsing until fine flour forms. Sift and continue with the recipe. It really helps if the egg whites are separated in advance. 24 hours in the refrigerator with the lid NOT tightly sealed, seems to work very well for me. Use powder food coloring or gel, but make sure there is no water stated as an ingredient. Few of my disastrous orange batches were colored using orange gel, but there was water in it and I am pretty sure this also boosted the poor outcome. Now, on lava … I live in a small European country and we don’t have any volcanoes, and even though we are planning a trip to Sicily and Etna, the chances to encounter any magma are not promising. So if you haven’t seen lava, you will have to mix the ingredients in blind. My biggest mistake was over-mixing. When you get to this point, add the almond mixture to the meringue in three additions. Fold the first one very thoroughly to lighten the mixture. Add the second addition and fold carefully, add the third and really watch not to mix too much. When you no longer see dry flour and sugar, stop mixing. The mixture should have little bumps and should not look smooth and uniform. 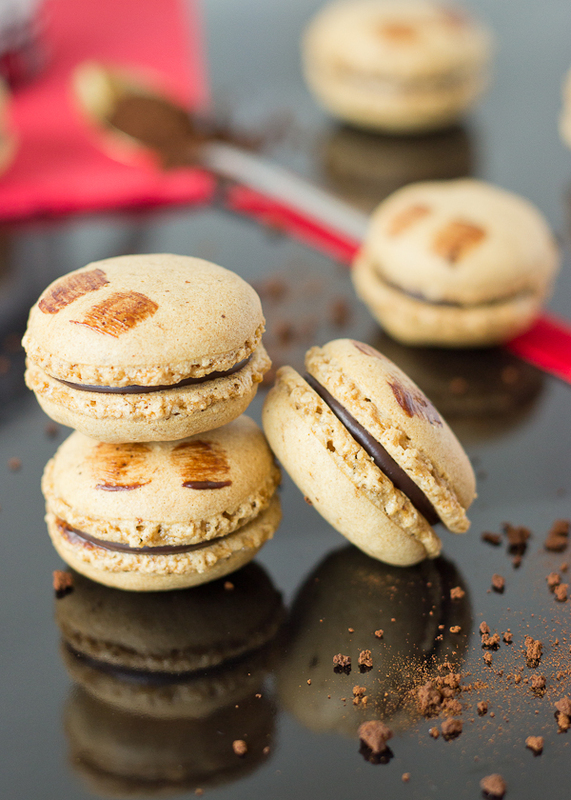 Let the macarons stay at room temperature to dry for at least 30 minutes after piping. It really, really helped me a lot. Bake at no more than 150 C, you can even go lower if you are using a fan, 140 with th fan on worked good for me. I used different recipes, but for the last two batches I used mercotte.fr recipe, because I was sure that it should work. And it did work, eventually. 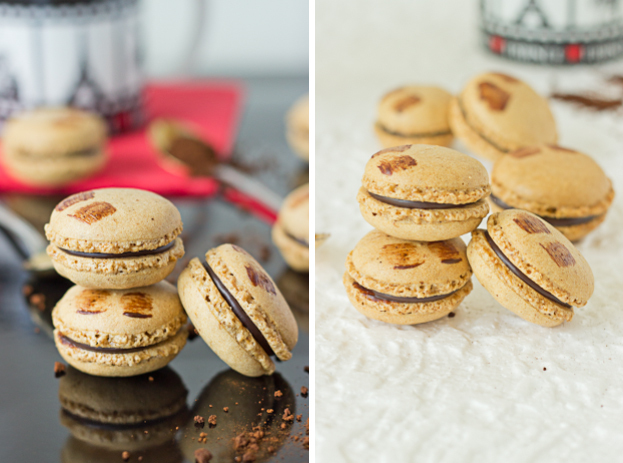 I know that everyone says that but practice is everything with the macarons. Every time you will get a little better. 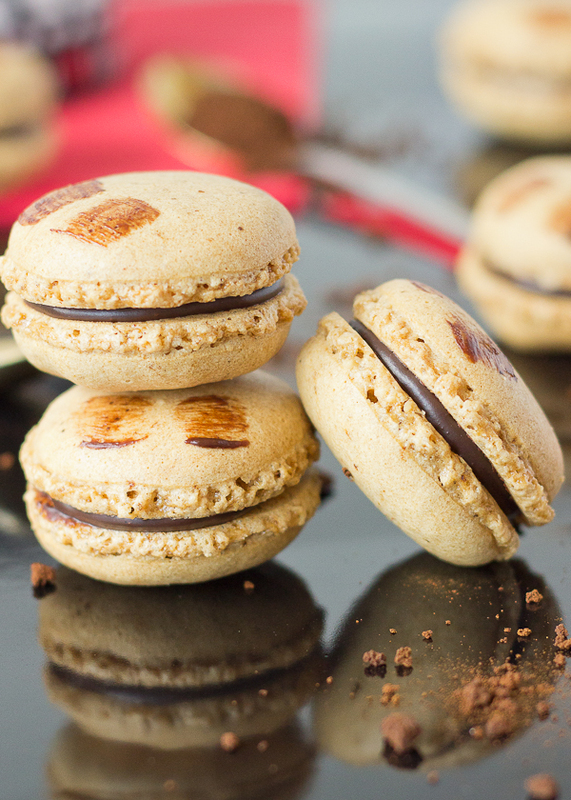 Coffee flavored Macarons with Mocha Ganache filling. Mix the almond flour, powder sugar and coffee powder in the bowl of your food processor and process until fine powder forms. Sift the mixture. Place the egg whites and salt in a large, clean, stainless steel bowl. Start beating with the whisk attachment of your mixer at high speed. When thick foam forms, start adding the sugar, a tablespoon at a time. Whip until stiff peaks form and the meringue is glossy. Take one third of the almond mixture and fold it thoroughly into the meringue. Gently fold the remaining almonds in two additions folding gently until just incorporated. Pipe the macarons using a plain tip and leave 5 cm. in between. Let sit at room temperature until the shell is no longer wet to the touch and a crust starts to form. Meanwhile preheat the oven to 150°C. Place the macarons in the oven and bake for 10-12 minutes. Chop the chocolate coarsely and place it in a small bowl. Bring the cream and espresso powder to a gentle boil over medium heat. Pour the cream over the chocolate, add the liquor and let sit for a minute. Mix until the chocolate is melted and incorporated into the cream. 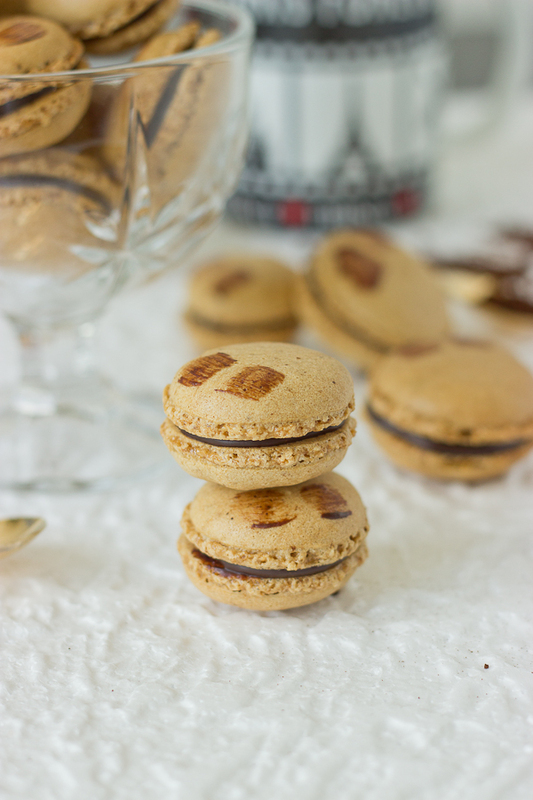 Let the ganache cool at room temperature and spread or pipe on the macaron shells to sandwich. 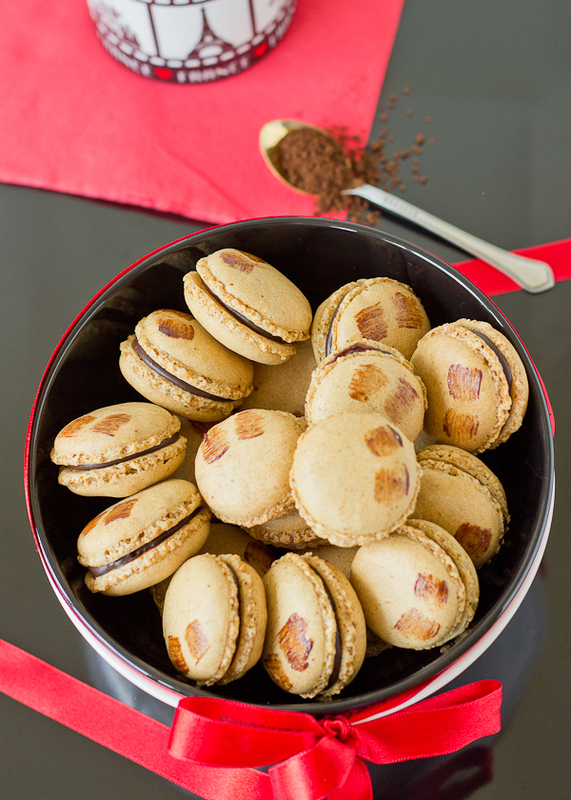 Place the filled macarons in an air tight container in the refrigerator, and leave them there least over night.